Academy for The Performing Arts - The Academy for the Performing Arts provides instrumental and voice instruction to students of all ages. 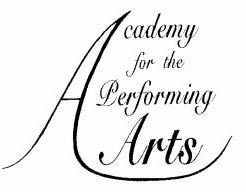 The Academy for the Performing Arts, Inc. is an independent, 501(c)3 non-profit community school providing year-round instructional and performance opportunities to help students of all ages reach their highest artistic potential. A distinguished faculty offers a comprehensive curriculum that combines interactive classroom learning with creative approaches to skill building and nurturing guidance on proper stage etiquette and technique. Economic barriers to participation are addressed through monetary donations and in-kind gifts.